Every once in a while, we have to remind ourselves that swimming has its lighter moments. Please feel free to add your own funny stories in the comments. Coach: It’s supposed to be kick. Why are you doing breaststroke? Swimmer: Because I’m trying to improve my sculling. Coach: I’m going to need your address. 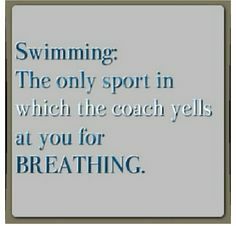 Swimmer: Coach! Alex is threatening to kill me. Coach: Alex! Don’t threaten. Just do it! Swimmer: I was doing fly! Coach: Why are you doing a different stroke than EVERYBODY else in the pool? Swimmer: I thought they were doing it wrong! Coach: John, that’s the worst zip up I’ve ever seen. Maria, what are you doing? Swimmer: Why do we have to do this set? Coach: This isn’t a democracy. 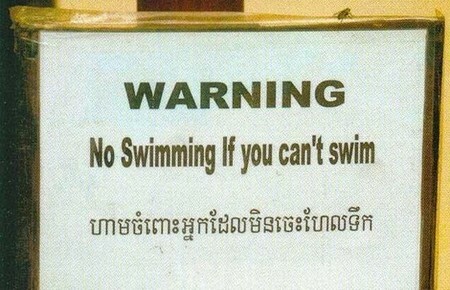 Swimmer: Well it should be! Coach: Do you even know what a democracy is? Swimmer (upon walking out on deck and seeing that the pool jets were turned on, dropped her bag and then ran): The world is ending. We’re all going to die! Coach: His parents traded him in for a dog. Keep swimming! Coach: Your breaststroke kick looks like a dying frog being electrocuted. Coach: Don’t forget to take 500 Megagrams of Vitamin C every day. Swimmer: Uhhh, isn’t that supposed to be 500 milligrams? 500 megagrams would be the size of this building! Coach: Don’t argue with me, just take it. Swimmer: Coach, I think I’m drowning. Coach: That’s fine. Just make the pace time and you can drown all you want. Swimmer: Can we do a 300 instead of the 400? Coach: No, but I’ll let you do two 200s continuous instead. Coach: You only did 300 on that repeat. Another 100 to go. Swimmer: You’re dreaming, coach. You’re still asleep. Coach: Then I’m dreaming that you’re doing another 400 after this. Swimmer: Wake up, coach! You’re having a bad dream! Coach writes 100, 200, 300, 400, 500 with 30 seconds rest between. Coach: That’s 1000 total. With the rest it should take you less than 15 mnutes. Swimmer: Uhh, coach. That’s 1500. Coach: Then you should be able to do it in even less time. Coach: You know the water’s transparent, right? I can still see you when you go under. Coach: Why did you get out of warmup early? Swimmer: I warmed up in the car on the way here. Sibling: You slept in the car. Swimmer: I warmed up in my sleep. Coach: How do you miscount in a 100? Swimmer: I thought it was a LC pool. Coach: You missed the wall. Why didn’t you go back to touch? Swimmer: The wall was too far away, and I wanted to beat the guy. Swimmer: Can we use lap counters for this race? Coach: No, it’s only a 200. Swimmer: But I can’t count up to 10 in my head! Swimmer: I just took over a minute off my 200 IM PB! Coach: I saw. How was your breaststroke? Swimmer: Uhhhh. I think I forgot to do the breaststroke. Coach: What happened to that nice quiet girl you used to be? A few years ago I had a senior swimmer at a meet who was really excited for his upcoming 50 Fly race. I reminded him as his race came closer, and then paid attention to corralling the younger ones. His heat was up, I saw he wasn’t there on the Lane 8 starting block. I turned around to ask someone if they’d seen him, and there he was texting on his phone. I yelled at him that his heat was ON THE BLOCKS, and he jumped up and ran the length of the 50 m pool, heading for Lane 8. I was sure he was going to miss his race. But as he was running, the starter asked the swimmers to step down. I thought, that lucky guy, he’s going to make it. As he got to Lane 8 he kept running around to Lane 1. Then a deck entry swimmer appeared in Lane 8. I was back to thinking he’s missed it. At this point, he was talking to the Lane 1 timer, and was redirected to Lane 8. As he ran back, the starter said “Take your marks”, and the deck entry in Lane 8 then false started before the gun even went off. They told everyone to step down again, and DQ’d the deck entry. This gave my swimmer time to get to Lane 8 and explain the problem. And amazingly they let him get on the block and swim his race. Previous Post Can Short Swimmers Compete at the Highest Levels? My favourite was during practice when 2 swimmers stopped in the middle of the pool and stared at the ceiling. Coach: STOP LOOKING AT THE HANDPRINT!